Norma M. Totushek, age 96, of Hutchinson, Minnesota, passed away Thursday, January 31, 2019, at Harmony River Living Center in Hutchinson. Memorial Service will be held Saturday, February 9, 2019, at 2:00 P.M. at Bethlehem United Methodist Church in Hutchinson with interment in Oakland Cemetery in Hutchinson at a later date. Gathering of Family and Friends will be held one hour prior to the service at the church. Norma Mae Totushek was born on May 14, 1922, in Svea, Kandyohi County, Minnesota. She was the daughter of Ralph and Maymi (Westerberg) Tatting. Norma was baptized as an infant in 1922 at Evangelical Lutheran Church in Svea, and was confirmed in her faith as a youth in 1934 at First Lutheran Church in Lake Lillian, Minnesota. She attended first through seventh grade in Lake Lillian and eighth through twelfth in Silver Lake, Minnesota. Norma was a graduate of the Silver Lake High School Class of 1939. She furthered her education at Parisian Beauty School in Minneapolis, Minnesota. On May 18, 1941, Norma was united in marriage to George Totushek in Silver Lake, Minnesota. This marriage was blessed with two children, Robb and Ross. Norma and George made their home in Hutchinson. They shared 59 years of marriage until George's passing in 2000. Norma was a loving mother and wife. She was a member of Bethlehem United Methodist Church. She sang in the church choir, was a member of the ladies group and the quilting group. Norma was also a charter member of the Hutchinson Hospital Auxiliary. Her passion was the Auxiliary Thrift Shop, where she spent countless hours. Norma was an enthusiastic volunteer. She was very involved with blood drives, elections, Cub Scouts and DeMolay. Norma enjoyed cross-stitching, knitting and baking her famous caramel rolls, kolaches and Christmas cookies. 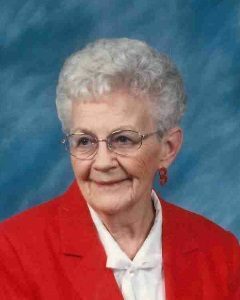 She also enjoyed playing cards, spending time at the cabin, fishing and neighborhood gatherings. Norma cherished her time spent with her grandchildren family and friends. Norma passed away on Thursday, January 31, 2019, at the Harmony River Living Center in Hutchinson, at the age of 96 years. Eloise Totushek of St. Cloud, MN; Many other relatives and friends. Norma is preceded in death by her Parents Ralph and Maymi Tatting; Husband, George; Siblings, Arlene Marohn, Roger Tatting, Helen Guthrie, Douglas Tatting, Barbara Tatting. Robb, Ross and Families, please accept our sympathy at the passing of your mother, Norma. My mother was also a member of the Hospital Auxiliary and always spoke well of your mom. May God grant you comfort in good memories.